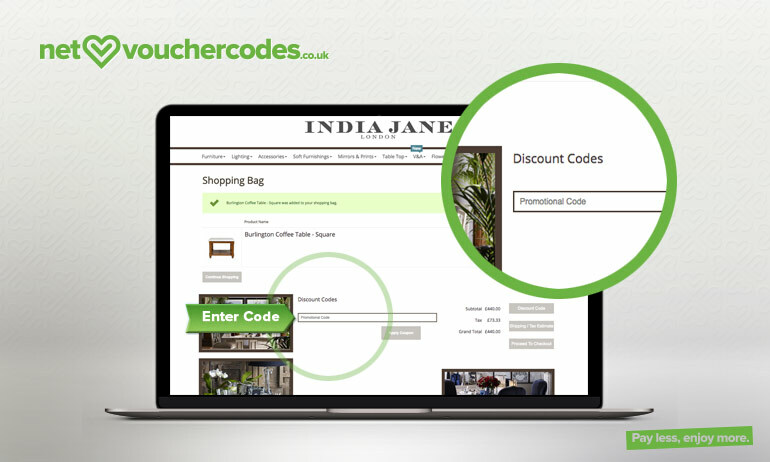 Where do I use my India Jane voucher code? 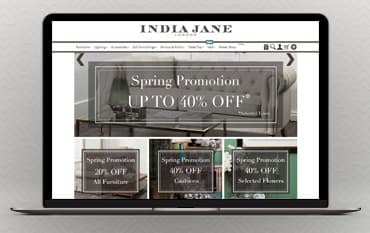 Copy a code from us and head to the India Jane website. Browse around for your ideal products and click ‘Add to bag’ on the products you want. On this page, you can paste your code into the ‘Discount code’ box and click ‘Apply Coupon’. Furnish your whole home with gorgeous furniture including chest of drawers, sideboards, cupboards and wardrobes, trunks and chests, bookcases and shelves, sofas, armchairs, dining chairs, chaise lounges, benches, footstools and ottomans. You can also find all sorts of tables including coffee tables, desks and dressing tables, dining tables, console tables, bedside tables and cabinets, side tables and lamp tables. There’s also table lamps, floor lamps, chandeliers, ceiling and wall lights as well as lampshades and bulbs. As well as selling an array of furniture, soft furnishings and accessories India Jane also has a flower shop. This collection offers a range of faux flowers and plants that are highly decorative and beautifully realistic, allowing you to display your plants and flowers within your home; a much-loved pastime that we've been doing for centuries. The India Jane flower shop ranges from long, brightly coloured stems to potted orchids and boldly shaped topiary- the choice is as broad as it is diverse. You’ll be pleased to know that a lot of the flowers and plants in the flower shop section are also discounted, allowing you to decorate every room in your home with colourful and stunning flora. The V&A range at India Jane stands for Victoria and Albert, taking inspiration from the extensive archives at the Victoria and Albert Museum, London. The collection encompasses lighting, decorative ceramics, drinking glasses, cushions and decorative trays, all taking qualities from the beautiful pieces of the royal past. If you’re a fan of the royal family, or simply love the elegance and uniqueness of vintage style then this collection is perfect for you. And, although each piece in the category looks incredibly premium and of the highest quality, all the items are still extremely affordable and great value for money. 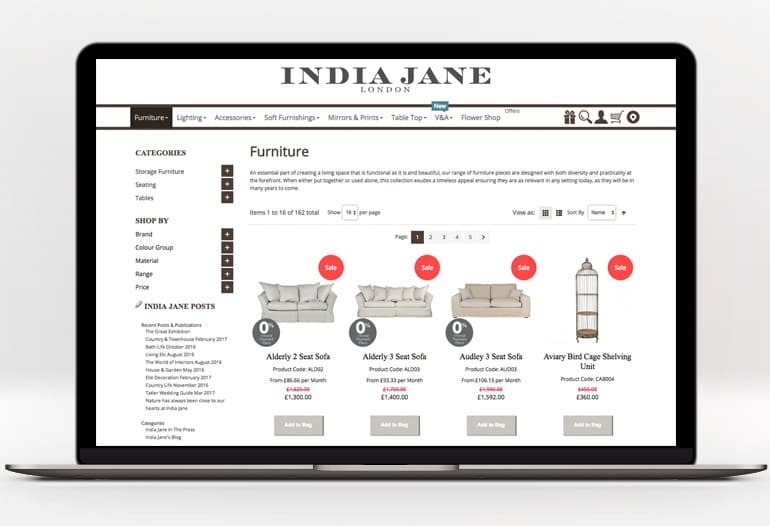 If you’re shopping on a budget you can find an array of affordable furniture, soft furnishings and home accessories in the offers section on the India Jane website. In the offers section, you can shop by brand, shape, colour group, lamp shade size, material, range, type and price to find your ideal product. Save up to 50% off a variety of popular products including sofas, cushions, light shades, tables and more, and accessories every room in your home with stylish furnishings for less. If you’re not completely satisfied with your purchase from India Jane please notify them within 7 days by telephone of your intention to return the product(s). India Jane request that you return products unused and in their original packaging within 28 days of the original delivery date. Please ensure that returns are packed and labelled carefully so that they are not lost or damaged in transit. Opening times vary depending on the store, to find the opening times of the store nearest to you please click on one of the 5 stores. India Jane is a British retailer of luxury interiors including furniture, lighting, accessories, soft furnishings, mirrors and prints, tabletop products and even flowers. Whether you’re looking for storage furniture, seating, tables, cushions, throws or even vases, you can find it all at India Jane. Shop online with an India Jane discount code from us and you could save money on all these products and more. You can also enjoy great savings in the offers section and sign up for the newsletter for the latest offers and deals.